Ethnic, alternative, minority or marginalized communities have long turned to the published word as a means of building identity, promulgating viewpoints and establishing some control over the development and dissemination of their own media images. Ethnic and other non-mainstream newspapers are treasured primary sources reflecting the diversity, vigor and strife typical of any multicultural society. *Dooley, P. (2009). History of journalism: 1930-1995. In C. H. Sterling (Ed. ), Encyclopedia of journalism (Vol. 2, pp. 707-712). A chronology of articles from the period January 1, 1890 to December 31, 1899. This database provides information about ethnic, minority, and special audience newspapers published in Washington, Oregon, Montana, Idaho, Alaska, British Columbia, and the Yukon. This database identifies ethnic, minority, and special audience newspapers published in Washington, Oregon, Montana, Idaho, Alaska, British Columbia, and the Yukon. Many ethnic groups are represented in the database, including African American, Alaska Native, Arab Canadian, Chinese American, Filipino American, Japanese American, Hispanic Canadian, Indian, Korean American, Native American tribes, Vietnamese American, and more. Many of the newspapers listed in the database are held in the UW Libraries Microforms & Newspapers Collection on microfilm. Newspaper page images, 1965-1997. Alaska Native. Newspaper page images, 1956-61, 1971-1988. Native American. "Published by the Confederated Salish and Kootenai Tribes of the Flathead Indian Reservation." Newspaper page images, 1843-1923. African American. 19th century newspaper page images, 1827 - 1902, including photos and illustrations. Newspaper page images, 1906- 1917. African-American. Newspaper page images, 1933-2003. African American. Newspaper page images, 1879- 1964. African American. Newspaper page images, 1828-1934. American Indian. Searchable database of newspaper page images, 1905-1975. For 1975 to 1996, use Microfilm A4066. For 1999 to present, use Ethnic NewsWatch. Newspaper page images, 1900-1904. Chinese American. Newspaper page images, 1860-1921. Includes mainstream and some ethnic newspapers. Newspaper page images, 1855-1859. Mexican American. Newspaper page images, March and April 1876. African American. Includes the Black Ink (Black Student Movement, University of North Carolina at Chapel Hill, 1969-2001). African American. Journal, magazine, and newspaper articles from ethnic and minority presses covering 1959-present. 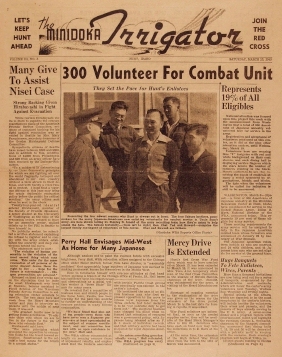 Newspaper page images, 1938- 1943. African American. Transcribed articles, 1852- 1855. African American. Newspaper page images, 1827-1829. African American. The first African-American owned and operated newspaper published in the United States. Newspaper page images, 1888-1915. African American. Newspaper page images, mid 1800s-1970s. Mexican American. Newspaper page images, 1899-2005. Missing 1917-1925. African American. Newspaper page images, 1851-1864. English-Spanish language. Newspaper page images, 1847-1860. African American. Newspaper page images, 1890- 1892, 1906- 1953. African American. Newspaper page images, 1929-1955. Asian American. Newspaper page images, 1965-1968. African American. Weekly newspaper founded to cover the Civil Rights Movement. Complete run. Newspaper page images, 1915- 1945. African-American. Transcriptions of selected articles, 1933. African American. Newspaper page images, 1916-1988. African American. Preserves and provides free access to the heritage of Canada's immigrant peoples. Includes newspaper page images for newspapers such as the Japanese newspaper Tairiku Jiho (The Continental Times).